After much deliberation and dramatic announcement ceremony on Wednesday, Steve Yzerman’s Team Canada has been named for the 2010 Olympics. The list, with some noticeable omissions, includes Flyers’ defenseman Chris Pronger and forward captain Mike Richards. Jeff Carter was placed on the stand-in list in case injury should strike a roster player. After missing 22 games due to a double hernia suffered on Oct. 26, Flyers’ forward Simon Gagne is set to make his return to the active lineup, Saturday against the New York Rangers. According to a report by Ruefrontenac.com, Montreal general manager Bob Gainey offered the Flyers a trade involving goaltender Jaroslav Halak, when it was made public that Flyers’ goalie Ray Emery would be out for six weeks with abdomen surgery. The original report had Gainey asking for a top-6 forward, but Gainey noted that wasn’t the case. The Flyers did not tender an offer for the 24-year old, who carries a $775,000 cap hit. On Tuesday, the Flyers picked up goaltender Michael Leighton off waivers from Carolina. Leighton will replace Johan Backlund as the back up until Emery returns. Halak is 6-5 this season with a 2.91 GAA. Flyers showing interest in Turco? According to multiple reports, most noticeably Bruce Garrioch of the Ottawa Sun, the Flyers have interest in acquiring 34-year old goalie Marty Turco of the Dallas Stars. 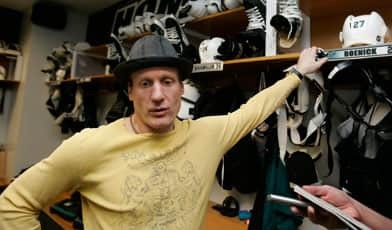 In a running segment on TSN.ca for Off the Record, former Flyer and all-time hockey great Jeremy Roenick, gives his two-cents about news from around the NHL. When hitting on the issue of his former club, Roenick gave a very interesting take. Emery placed on IR with ab injury. Out six weeks. After stating before Monday’s contest against Montreal that goaltender Ray Emery has “some nagging injuries, but is fit to play,” the Flyers have placed Emery on injured reserved with an abdomen injury. Brian Boucher is set to make back-to-back starts for the second time this season. Emery will need surgery to repair the tear and will miss six weeks. Emery, who was thought to be held out of the game in Montreal to gain confidence against a weaker Islanders team, was abruptly placed on the IRwithout any media notification. General manager Paul Holmgren will address the situation prior to the tonight’s game. An injury could explain why Emery has hit a wall this season. After beginning the year with a respectable record and a goals against average of just over 2.00, Emery has dropped four of his last five starts.